Oh dear. This has been sitting quietly on my shelves waiting for me to notice it's not in the gallery.. Height 20 cm including lid. Hahaaa and what an oddity it is too, but the pattern is familiar. I could have had a set of this but the auction was pickup only and I couldn't do it. Real ugly but a must have! 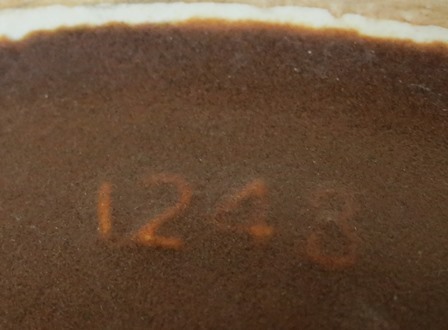 Was there a matching jug for 1328 "New Squares" mug too? I don't see any gaps in the gallery for it. 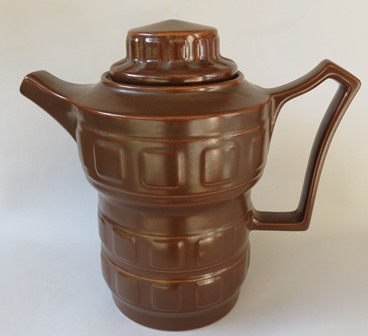 Sorry Ev, I meant "pot" rather than "jug", as in a coffee pot in the new "Squares" pattern. I rembered to change it, then I forgot! Squares was one of the castware mug shapes that had a complete matching coffee set. I was wondering if a Crown Lynn made a coffee set to match the "new Squares" mug 1328. I haven't seen any evidence of it yet. That's all. I stand corrected. The original handle is so grotesque that I must have been looking at it with my eyes shielded for fear of catching something.